Albion College alumnus Dr. Samuel Shaheen, ’88, is leading the development of a boutique hotel and conference center in downtown Albion. On Tuesday July 28, the Michigan Economic Development Corps. (MEDC) announced a $1 million Michigan Community Revitalization Program performance-based grant for the project. The City of Albion Brownfield Redevelopment Authority is providing $963,146 and Albion College is loaning $4 million for the development. According to the MEDC press release, the hotel will cost $8.4 million overall and create 20 jobs. The four-story building will consist of 72 rooms, a combination of standard and extended stay suites. The project also includes a 3,000-square-foot conference center for meetings, weddings, banquets and community events. The entire project will redevelop about 1.25 acres of land. Mitchell offered as an example the Oakland Kidney Dialysis Center, which will open in Albion at the end of the year, bringing jobs and health services. Albion’s equestrian center will also undergo a major expansion in the near future. The center will attract regional equestrian competitions to Albion. Mitchell added that three national trail networks converge at Albion. She predicts that Albion’s trails and waterways will become major recreational attractions as more travelers stay in town. Albion College President Mauri Ditzler also stated the importance of an economically strong community. According to Ditzler, a vibrant town will benefit the college by attracting more students and the best faculty. A strong community will also benefit alumni. “Alumni have an investment in the health and the quality of the institution. The healthier an institution, the better its reputation 20, 30, or 40 years out, the more value your diploma has,” Ditzler said. Ditzler also added that the return on Albion’s investment in the hotel will be used to fund student scholarships. Shaheen’s company, Shaheen Development, will begin site work and demolition for the hotel in spring of 2016. Shaheen expects construction to take a year. The company plans to use a color palette and exterior materials similar to the rest of downtown, so that the new hotel will fit in with Albion’s historic character. Shaheen anticipates the hotel hosting business meetings, wedding receptions and more as well as providing lodging for I-94 travelers, businesspeople and family and friends of Albion College students. Mitchell expressed optimism for Albion’s future and economic growth. 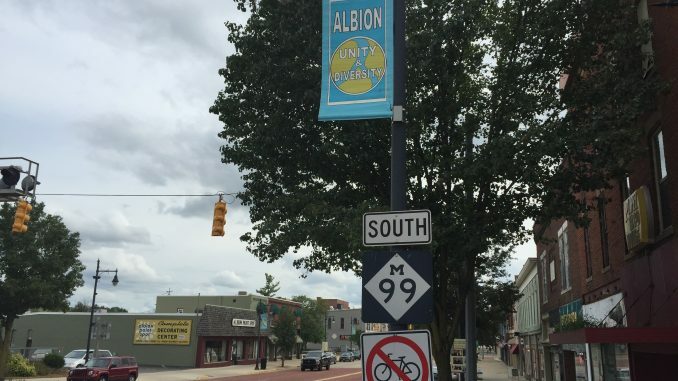 In five to 10 years, she said, she sees Albion as one of the top places to live in the Midwest. However, she gives most credit to Albion’s citizens.